His Holiness Pope Benedict XVI is the 265th and current Pope, by virtue of his office of Bishop of Rome, the Sovereign of the Vatican City State and the head of the Roman Catholic Church. He was elected on 19 April 2005 in a papal conclave, celebrated his Papal Inauguration Mass on 24 April 2005, and took possession of his cathedral, the Basilica of St. John Lateran, on 7 May 2005. 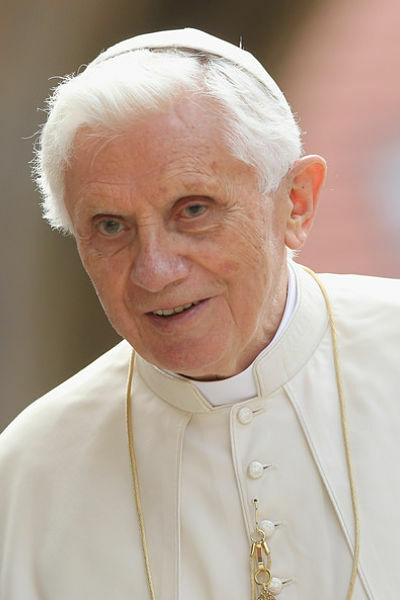 A native of Bavaria, Pope Benedict XVI has both German and Vatican citizenship. After a long career as an academic, serving as a professor of theology at various German universities” most recently at the University of Regensburg” he was appointed Archbishop of Munich and Freising and cardinal by Pope Paul VI in 1977. In 1981, he settled in Rome when he became Prefect of the Congregation for the Doctrine of the Faith, one of the most important offices of the Roman Curia. From 2002 until his election as Pope, he was also Dean of the College of Cardinals, and as such the primus inter pares among the Cardinals. Prior to becoming Pope, he was "a major figure on the Vatican stage for a quarter of a century" as "one of the most respected, influential and controversial members of the College of Cardinals"; he had an influence "second to none when it came to setting church priorities and directions" as one of Pope John Paul II s closest confidants. Like his predecessor, Benedict XVI is theologically conservative and his teaching and prolific writings defend traditional Catholic doctrine and values. During his papacy, Benedict XVI has advocated a return to fundamental Christian values to counter the increased secularisation of many developed countries. He views relativism s denial of objective truth, and the denial of moral truths in particular, as the central problem of the 21st century. He teaches the importance of both the Catholic Church and an understanding of God s redemptive love. He has reaffirmed the "importance of prayer in the face of the activism and the growing secularism of many Christians engaged in charitable work." Pope Benedict has also revived a number of traditions including elevating the Tridentine Mass to a more prominent position. Description above from the Wikipedia article Jeff Anderson, licensed under CC-BY-SA, full list of contributors on Wikipedia.